This is a guest post by Aleh Barysevich, Marketing Director at Link-Assistant.Com. Press release distribution is something each site owner has at times considered for promotion. Some of us want more search traffic as a result of press release distribution; others seek media outreach. Some opt for free distribution, others use paid services. Few are aware that services vary depending on how they’re used and make their choice accordingly. But at the end of the day, the question is: how do I evaluate if a press release really did the job? Apparently, the outcome should depend on the goals, so let’s start with a list of goals site owners usually set for press releases. What are the goals for press release distribution? Similar to the Maslow pyramid, most fundamental needs are at the bottom, i.e. 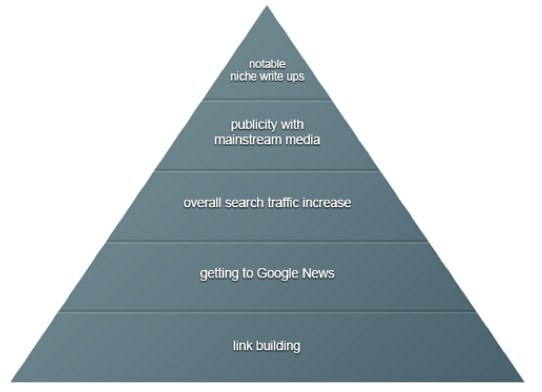 basically site owners view press releases as a link building method. They want to increase rankings of their websites through a massive link blast. The second-level goal is getting first page exposure in Google News for target keywords. With the bigger picture in mind, online entrepreneurs look for focused press coverage, be it mainstream media or notable niche sites. Consequently, here is what you should check out to see if your press release worked out. These data are usually provided by paid services like PRWeb, PR Newswire and Marketwire– they list sites that republished your press release unchanged. Do exact match search for your press release’s title. 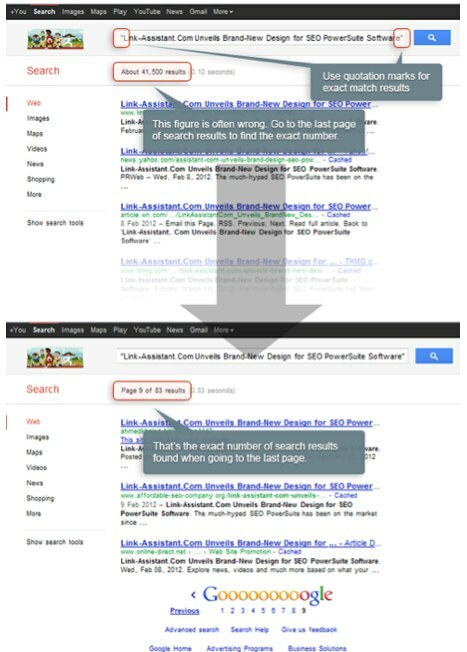 You’ll get the number of pages indexed by Google. If you’re keen on press release distribution as a link building method, you’ll find this indicator most important. To get exact match results, put your title into quotation marks. The number of search results you first get under your search query is often wrong. To find the true number of indexed pickups, get to the last page of search results. It should be noted that this method is a quick, yet rough estimate of your online pickups – it might include duplicate results or some results might be omitted. Still, it comes in handy for on-the-surface analysis. Check out if your press release has reached Google News for your target keyword. Interestingly, both free and paid distribution services can take you to Google news. It means that if getting your press release to Google news is your major goal with press release distribution, first test out free services to find the one that takes you to Google News most consistently. 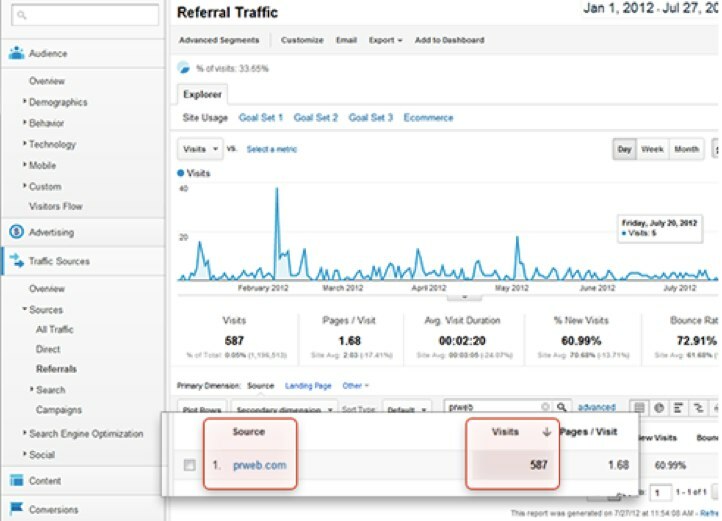 On the most basic level, check out referral traffic brought to your blog from the distribution service’s website. 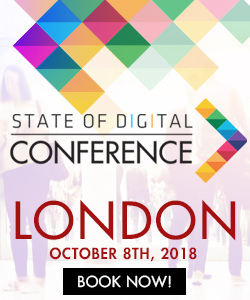 Remember to elaborate your links with unique parameters for each press release campaign – you can generate them with the help of Google URL Builder. 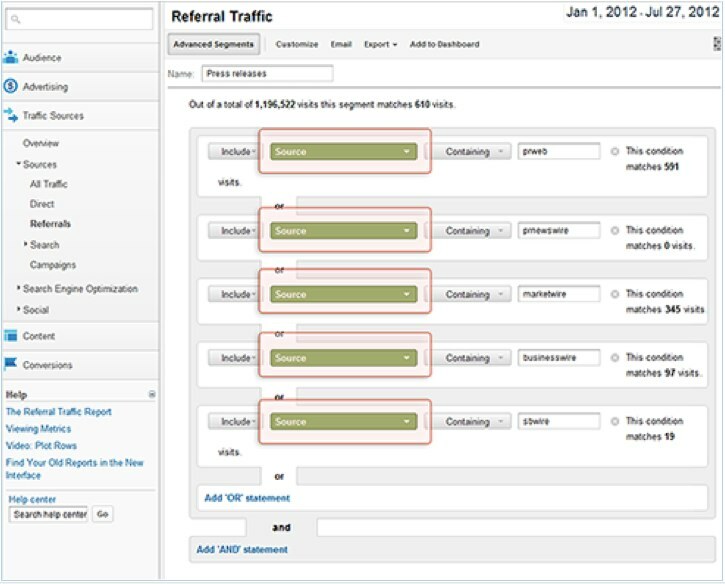 Tracking links through unique parameters is a more refined method than checking out referral traffic from the distribution service’s site. Wherever your press release lands – and it might well land on hundreds of websites – you’ll know how many visitors it has brought as a whole. This method works best if you want to compare performance of several press release distribution services. Create an advanced segment in your Google Analytics dashboard to include the press release distribution services you use and have their performance featured line by line. Wherever your press release lands, visitors will come to your site via this link, and you’ll know for sure how many visitors the campaign as a whole brought you. Was your news story picked up by mainstream media? How notable are the mainstream media sites that featured your story? Were they CNN, Forbes, FastCompany or tiny local information services? You can get these data from your press release distribution report: top-tier press release services usually provide clients with full lists of sites that picked up their press releases. Finally, the most important question to ask yourself is whether you got any write ups from notable sites in your niche. This last criterion is by far the most advanced in evaluating your press release performance, so make sure you have Google Alerts set up for your brand name not to miss out on them. So, how do you check out if your press release did the job? It’s simple: clarify your press release distribution goals and evaluate the performance through logical and data-driven metrics. 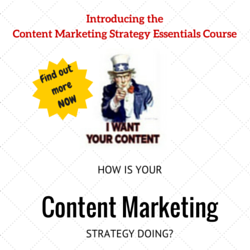 Have you ever promoted your site with press releases? What goals did you have in mind? How did you measure your press release distribution results? Share your experience in the comments! 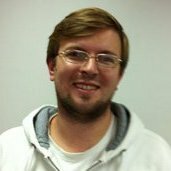 Aleh Barysevich is a Marketing Director at Link-Assistant.Com, the company that makes SEO PowerSuite – a website promotion toolkit for bloggers, webmasters and online marketers. Great post with different idea. Thanks. A great tip for monitoring & tracking the pick ups of your PR is by using a simple service called PRTrack.it (http://prtrack.it). I’ve been using it for a while now and it saved me A LOT of time.